Your first step in any problem that involves partial fractions is to recognize which case you’re dealing with so that you can solve the problem. The simplest case in which partial fractions are helpful is when the denominator is the product of distinct linear factors — that is, linear factors that are nonrepeating. The number of distinct linear factors in the denominator of the original expression determines the number of partial fractions. In this example, the presence of three factors in the denominator of the original expression yields three partial fractions. You have two ways to find the unknowns in a sum of partial fractions. 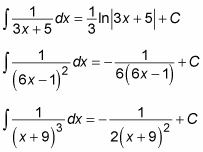 The easy and quick way is by using the roots of polynomials. Unfortunately, this method doesn’t always find all the unknowns in a problem, though it often finds a few of them. The second way is to set up a system of equations. This answer uses K rather than C to represent the constant of integration to avoid confusion, because you already used C in the earlier partial fractions.